Watched this the other night without knowing a great deal about it, but thinking it was a bit like Taken: butch and action-y. 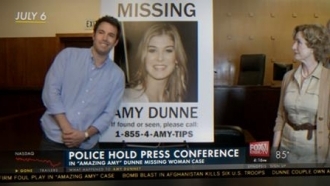 Gone Girl turned out to be a really gripping, clever and well-acted psychological thriller. A recently-married couple's life gets a bit complicated when she (Rosamund Pike) disappears (gone girl..) without warning, leaving behind evidence that the disappearance involved violence. Her husband (Ben Affleck) is a bit of a cold fish and quickly arouses suspicion that he was somehow involved. The truth is rather more complicated. The story is complex but entirely realistic and somewhat understated. Oh, and it lasts two and a half hours yet my wife stayed awake for the whole thing, which says a lot! Another great film from M. Night Shyamalan, the guy who directed The Sixth Sense, Signs, Unbreakable and more. It's a cracking thriller and it's connected to one of his other films but I won't spoil which one for you. 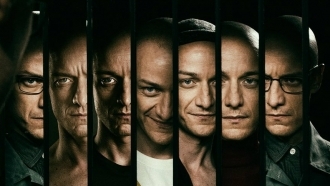 Three girls get kidnapped right at the start and the film follows four main characters (well maybe 27), the three girls and Kevin Wendell Crumb, the kidnapper (amazingly portrayed by James McAvoy), who has been diagnosed with dissociative identity disorder and has 23 distinct personalities. It's really engaging, scary in parts and as the film progresses it brings in some freaky supernatural elements that keeps you on your toes. A highly recommended watch with some fantastic acting and a really exciting storyline. Watch. Everybody has heard of the Kray twins, and if you haven't, they ran organised crime in London for most of the 60's. One of the best things about this movie is that both twins are played by Tom Hardy. I don't know how they did it but it's filmed really well (especially when they're fighting each other in one scene) and two cracking performances from Tom Hardy wrapped up in one film. 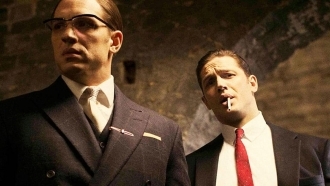 Legend is a great gangster movie and follows the twins as they take over London. The twins are very different, Ronnie being completely crazy and wreckless while Reggie is calmer and more calculated, having to reign in his brother. Ronnie is eventually the cause of their fall from organised crime kingpins, shooting a high ranking member of an apposition crime syndicate. There's a great supporting cast including Taron Egerton, Christopher Eccleston, David Thewlis, Paul Bettany, Emily Browning, Tara Fitzgerald and there's even a few appearances from Duffy who did a lot of the singing in the Krays' club. Defenately put it on your watch list! For those of you that don't know much about what happened at Dunkirk in 1940. A large number of allied forces were cut of and surrounded by German forces at the start of WWII and were in need of evacuation. 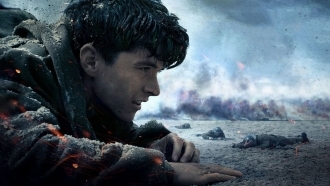 This film highlights some of what happened over the few days of the Dunkirk evacuation. I won't go into too much detail about what happened but I'll talk about the film in general. It was filmed slightly differently than I expected and was a little difficult to follow at times, as most of the film is one sequence of a few hours but then you see the same events happening from lots of different pespectives. There is some really good acting, the events that you see are amazing and I'm glad I watched it. But overall I'm not a massive fan of how it was filmed and I found it very slow moving, so if you're expecting a Saving Private Ryan type of film, I would probably give it a miss. I have to say, I wasn't expecting much from this film, I thought there would be some good action and the storyline would be a bit ropey. However, I was pleasently supprised! With some big names in it, for more than just a cameo, the acting is great, the storyline is clever and the car chases are awesome! 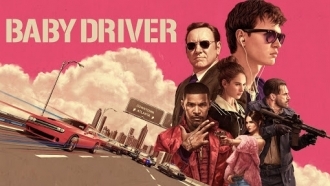 Really it all revolves around a romance between Baby (Ansel Elgort) and Deborah (Lily James) and Baby trying to hide the fact that he's a getaway driver, although he's being forced into it. Desporate to get away from his criminal activities, lets see how he gets on and will he drive off into the sunset?